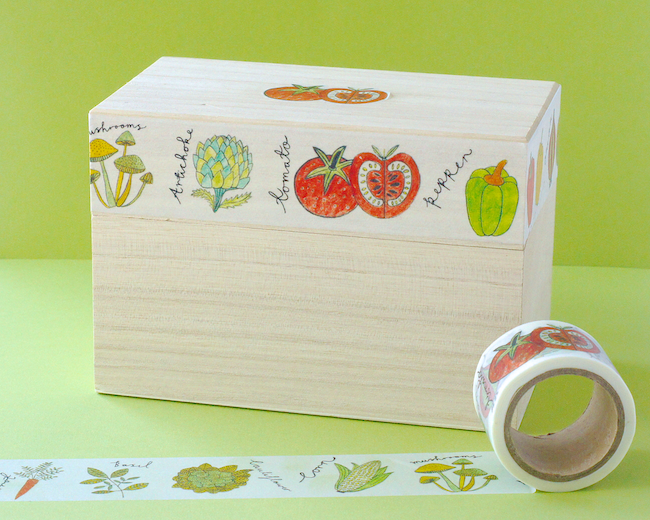 I'm a big fan of the Vegetable Lover washi tape we have in the shop right now. But, to be honest, sometimes I find these illustrated rolls challenging - how to use them to their full advantage rather than just sticking a strip on the back of an envelope - not that there's anything wrong with that, but I do like options! Plus an accent sticker right on the top. Perfect! And how cute is that tomato? I've left this unsealed... because indecision is my middle name and I might just want to give this box a different look somewhere down the line... but for more durability, I'd recommend adding a coat or two of Mod Podge or a similar sealant to keep your washi tape in place and looking fresh. I'd love to know - how do you use wide illustrated rolls of tape like this one? For more project ideas using illustrated washi tapes, check out these recipe cards, stickers and notecards.